Diff between database and user? Both may own objects such as tables, views, macros, procedures, and functions. Both users and databases may hold privileges. However, only users may log on, establish a session with the Teradata Database, and submit requests. A user performs actions where as a database is passive. Users have passwords and startup strings; databases do not. 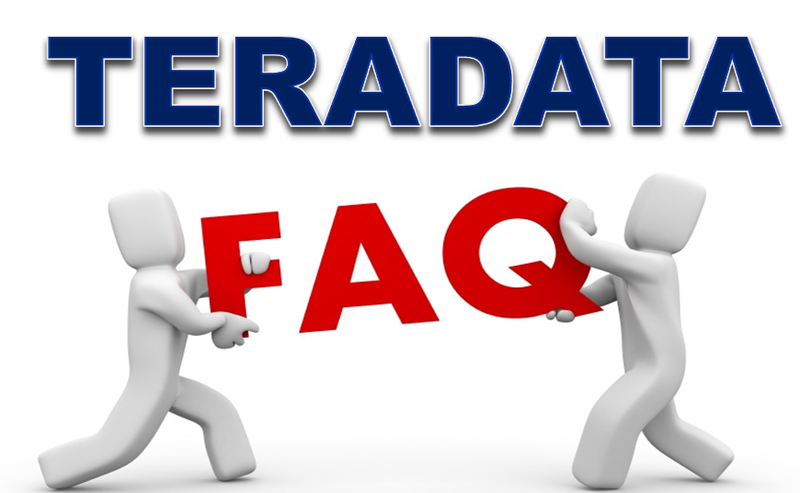 Users can log on to the Teradata Database, establish sessions, and submit SQL statements; databases cannot. When a PI is not mentioned on a table, how will Teradata consider the PI for that table? If you don't specify a PI at table create time then Teradata must chose one. For instance, if the DDL is ported from another database that uses a Primary Key instead of a Primary Index, the CREATE TABLE contains a PRIMARY KEY (PK) constraint. Teradata is smart enough to know that Primary Keys must be unique and cannot be null. So, the first level of default is to use the PRIMARY KEY column(s) as a UPI. If the DDL defines no PRIMARY KEY, Teradata looks for a column defined as UNIQUE. As a second level default, Teradata uses the first column defined with a UNIQUE constraint as a UPI. If none of the above attributes are found, Teradata uses the first column defined in the table as a NON-UNIQUE PRIMARY INDEX (NUPI). What is covered query in Teradata? If a SELECT query covers all the columns that are defined in the JOIN INDEX as join columns, such type of queries are called as COVERED query. What is the use of WITH CHECK OPTION in Teradata? In Teradata, the additional key phase: WITH CHECK OPTION, indicates that the WHERE clause conditions should be applied during the execution of an UPDATE or DELETE against the view. This is not a concern if views are not used for maintenance activity due to restricted privileges. Teradata has a concept of identity columns on their tables beginning around V2R6.x. These columns differ from Oracle's sequence concept in that the number assigned is not guaranteed to be sequential. The identity column in Teradata is simply used to guaranteed row-uniqueness. Granted, ColA may not be the best primary index for data access or joins with other tables in the data model. It just shows that you could use it as the PI on the table. How to implement UPSERT logic in Teradata using SQL? We have MERGE-INTO option available in Teradata data which works as an UPSERT logic in teradata. If the condition matches then update else insert. What is value ordered NUSI? When we define a value ordered NUSI on a column the rows in the secondary subtable get sorted based on the secondary index value. The columns should be of integer or date type. This is used for range queries and to avoid full table scans on large tables. What are the DBQL tables. Database Query Log tables are the tables present in DBC database which store the history of all the operations performed on the tables present in the databases. The history could get very large so these tables should be purged when the data is no longer needed. What is the difference between sample and top? The Sampling function (SAMPLE) permits a SELECT to randomly return rows from a Teradata database table. It allows the request to specify either an absolute number of rows or a percentage of rows to return. Additionally, it provides an ability to return rows from multiple samples. The TOP clause is used to specify the number of records to return. The TOP clause can be very useful on large tables with thousands of records. Returning a large number of records can impact on performance. SELECT TOP 2 * FROM EMP. What is difference between ZEROIFNULL and NULLIFZERO ? The NULLIFZERO function: will pass null when data coming as zero. Range_N is defined on a partition primary index to specify the range of values of a column that should be assigned to a partition. What is Casting in Teradata ? Can we do collect stats on a table when the table is being updated? No.We never collect stats on a table when the table is being updated. It will go for dead lock. When will you go for hash index? A hash index organizes the search keys with their associated pointers into a hash file structure. We apply a hash function on a search key to identify a bucket, and store the key and its associated pointers in the bucket (or in overflow buckets). Strictly speaking, hash indices are only secondary index structures, since if a file itself is organized using hashing, there is no need for a separate hash index structure on it. Difference between Global and Volatile Temporary Table? Where they can be used and how they can be used? A very large number of global tables can prolong logoff, because materialized global tables are dropped automatically at session end. A very large number of volatile tables can prolong logoff, because volatile tables are dropped automatically at session end.